Travelling with kids in Thailand – babies to teens – is a joy as the Thai people are renowned for their love of children. Luckily, there are lots of places to visit and plenty of family things to do in Thailand to keep entertained even the youngest of the brood. Apart from splashing about in the shallow water bays, there are water parks, snorkelling trips, street markets cultural centres and some of the best food in the region. We have created some recommendations of where to go in Thailand with kids, including family beach destinations like Koh Samui or flying high in the canopy over the hills of Chiang Mai. Thailand is a country of great natural attractions which are easily accessible and are good for the education of all the family. 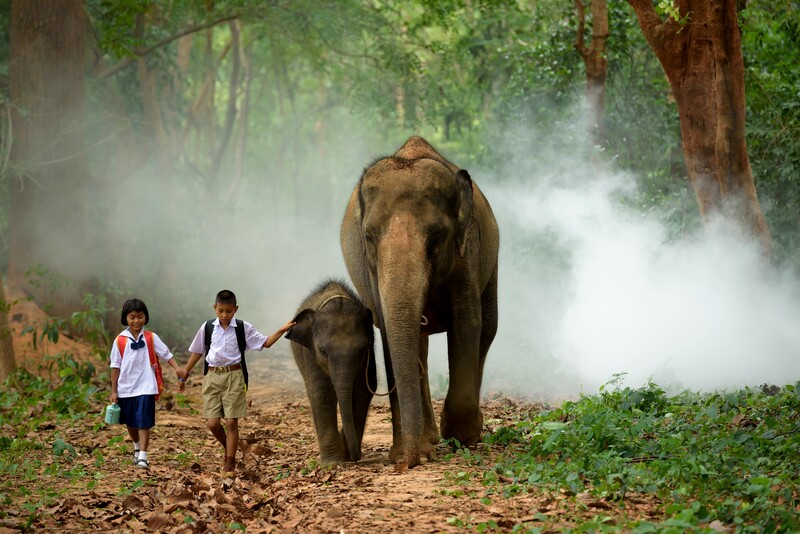 If you are wondering what family things to do in Thailand, then a fantastic day trip from Chiang Mai is to the Elephant Nature Park where rescued elephants have found a new home and a caring team. No elephant rides are on offer, but you can see the elephants roaming freely, feed them their lunch, help give them a bath and learn how and why these magnificent creatures are such an important part of Thailand. Note that this is the only real elephant sanctuary in Thailand, while the rest of the parks and spots belong to the commercial entities. Check out www.elephantnaturepark.org for more information. Looking for a villa to stay at with your family? See the Spa Villa and Chiang Mai Villa in Chiang Mai. 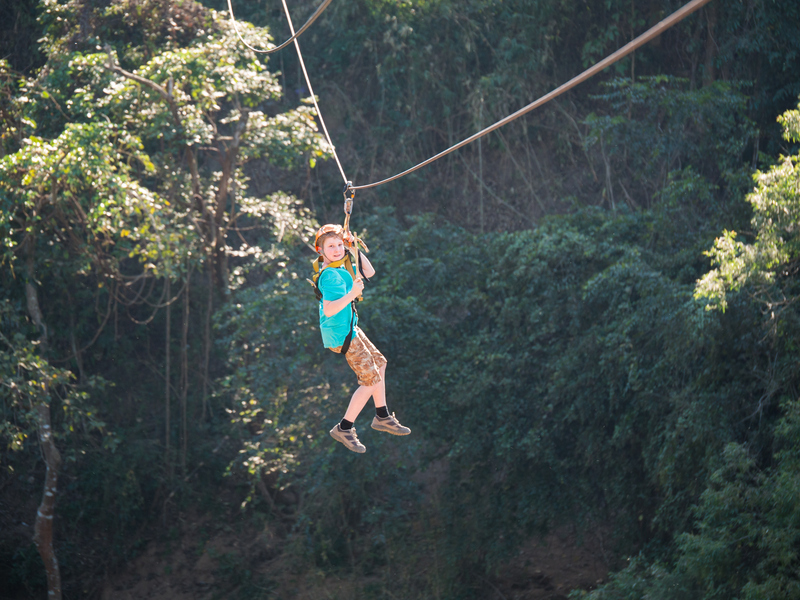 If your family likes a bit of adventure and doesn’t always need their feet firmly on the ground, then a great thing to do in Thailand with kids is a Canopy Adventure. The instructors will brief you on the harness and ropes and accompany you on your treetop journey, so you are always in safe hands. The zip lines take you between trees, and up and down their trunks and with 2000 metres of line to experience, you’ll get the closest to being an arboreal creature as possible! You can find operators in Koh Samui, Pattaya, Phuket and Chiang Mai. Check out the Canopy Adventures website canopyadventuresthailand.com for more information. Looking for a family accommodation? See Villa Baan Apsara, Villa Momo, Melodious Villa and Lana Thai Villa in Koh Samui, Phuket, Pattaya and Chiang Mai. Why not learn a new skill as a family while you are in Phuket? Head to one of the best family beach destinations in Thailand, don your surf shorts and go to Kata beach – the ‘Surfing Mecca’ of Phuket. The wave height generally reaches around two metres, so it’s perfect for beginners and advanced riders. A two-day course with good guides and experienced instructors will get you up on the board and gliding on the perfect wave. 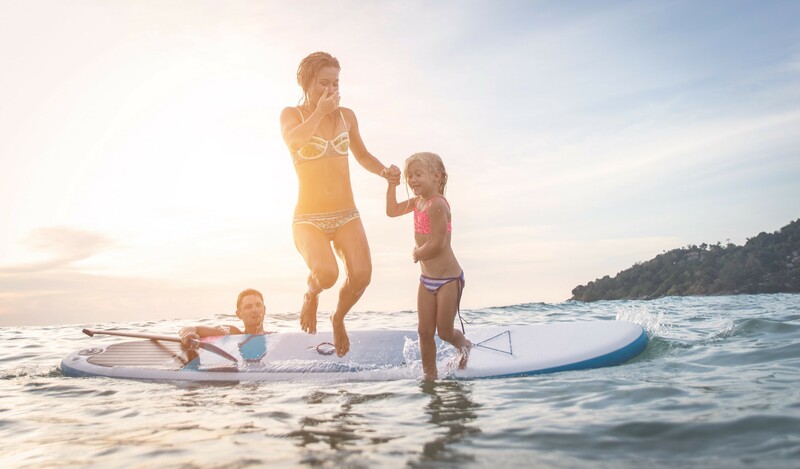 Paddleboards and boogie boards are also available to rent if surfing lessons aren’t for all the family. Kata beach is also a lovely place to visit with family in Thailand, so if not everyone is up for surfing, there’s a great beach to explore. Check out www.phuketsurfing.com for information on courses and rental. Searching for a family accommodation? See Villa Momo and Villa Hiwa in Phuket. If you are choosing where to go in Thailand with family and would like to give something back when you are on holiday, then the Soi Dog foundation on Phuket is a worthy cause. Set up by a British couple and run by a team of passionate, dedicated volunteers, the foundation offers neutering programmes, vaccinations and medical treatment, all entirely reliant on donations. A volunteer will show you around so you can meet the doggy inmates and learn about the much-needed work that the foundation does to help those less fortunate hounds. If you also want to participate, you may walk with the dogs and donate to the foundation. It’s a worthwhile thing to do in Thailand with kids if you have the time. Check out www.soidog.org for more information on how you can help. Take a look at the family villas close to the dog rescue center: Villa Nusa, Malaiwana Duplex and Villa Flores in Phuket. Thailand’s oceans house a myriad of fabulous undersea creatures and beautiful corals and this world can easily be explored whether you are an advanced diver or looking to learn. If you are interested in diving and trying to decide where to go in Thailand with family, Koh Samui is a popular diving destination due to its calm waters and proximity to world-class dive sites. Various lengths of dive courses are available from a two-hour pool Discover Scuba Diving session, through to one, two and three-day options to a full four-day Open Water Course. If there are divers and non-divers in the family, it’s no problem, as a trip to the Ang Thong marine park or the island of Koh Tao is a great thing to do in Thailand with kids and there are plenty of swimming, beach and snorkelling options. Check out the 100 Degrees East www.100degreeseast.com for more information. See Villa Orchid, Villa Mai Tai and Villa Suralai to spend an unforgettable time in Koh Samui. Phuket is a great place to go with kids as it offers so many options for those deciding on the family things to do in Thailand. Although Phuket is one of Thailand’s top beach destinations for families, sometimes people look for a change, and that’s where a water park is a perfect alternative. 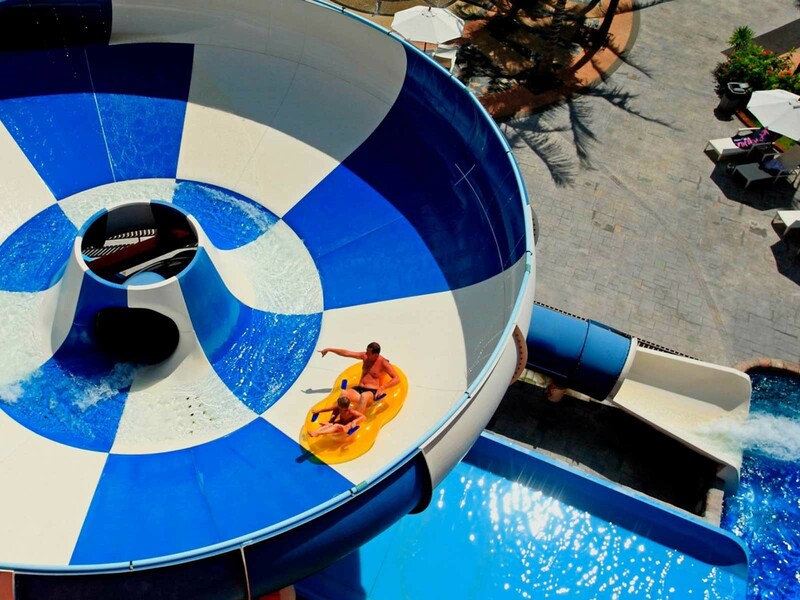 A great place to visit with children is Splash Jungle Water Park where there are enough things to do with kids and keep your family occupied for the whole day. Helpful staff and lifesavers ensure a safe play environment as you drift through the family raft ride, speed through a spiral tunnel or grab a tube and twist your way down the Super Bowl slide. There are restaurants on site with kid’s menus and food, sunbeds to relax on and private salas (small open-sided pavilions) to rent so you can strike a balance of adrenalin rushes and chilling! Check out splashjungle.com for more information. Searching for a family house in this area? See Tantawan villa and Villa Sipura in Phuket. One of the most popular Thailand family beach destinations is Koh Samui, as it offers quiet, family orientated beaches and plenty of other activities on and off the beach to keep the family happy. 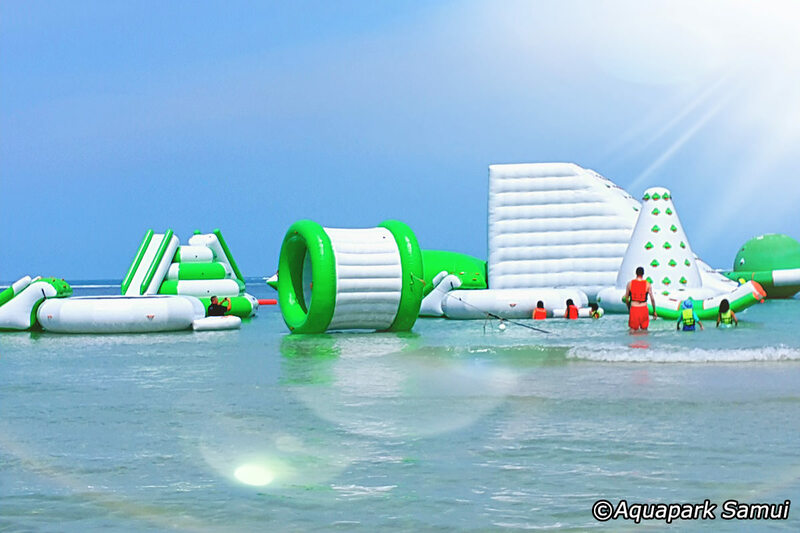 On Chaweng beach, you’ll find the Aqua Park – a selection of giant inflatables to jump around on right off the beach, which will suit you perfectly if you are searching for things to do in Thailand with kids. Climb, jump, bounce, balance and shimmy on the iceberg, the catapult, the spinning log bridge, the hamster wheel and rocking planets- it’s fun for all the family. Check out www.facebook.com/AquaparkChaweng/ for more information. Looking for a family holiday villa? See Baan Arun Villa and Villa Dove in Koh Samui. If you are a family with older children and are looking for a real challenge, then an exciting thing to do in Thailand with kids is to head to Hua Hin and have a go at kitesurfing. Hua Hin’s 6km shallow water beach and a healthy wind season makes it the perfect place to learn. If you would like to become really proficient, a three-day course is recommended. However, if time is limited, a one-day discovery course gives you the basic skills and understanding of kitesurfing and the equipment. Hua Hin is another excellent family beach destination in Thailand and not just for the kitesurfing! If you would like to stay in Hua Hin, have a look at Modern Tropical Villa and Baan Sansuk Villa. 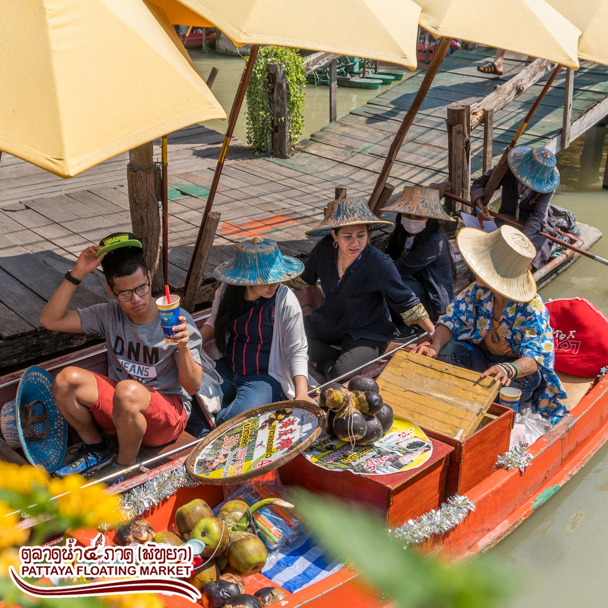 Thailand has a rich culture that local people are very proud of, and a paddle through the floating market in Pattaya is a great thing to do with kids in Thailand giving a glimpse of Thai heritage. See the canal boats piled high with fresh fruit, veg and flowers as the sellers ply their wares, sample local delicacies and bargain for handmade artefacts. Traditional Thai teak houses line the canals and give you a glimpse of Thailand’s past. In addition to the market, there are amphibious boat rides, a haunted mansion, a maze runner, and daily cultural shows and traditional games like sea boxing and blindfold boxing. No doubt, this is one of the most interesting and fun cultural places to visit in Thailand with children. Check out www.pattayafloatingmarket.com for more information. If you would like to find a family house close to this area, have a look at the Thammachat Victoria II and Villa Majestic in Pattaya. One of the many concerns of travelling with a family in Thailand is about kid’s food as we traditionally think of Thai food being incredibly spicy and pungent. However, in fact, it is prepared freshly and hygienically with local ingredients. Thailand has a lot of suitable kids’ food if you know what to ask for. The classic Thai dishes of Pad Thai, Fried Rice, Spring Rolls and chicken satay are great kid’s food in Thailand– being non-spicy and tasty. 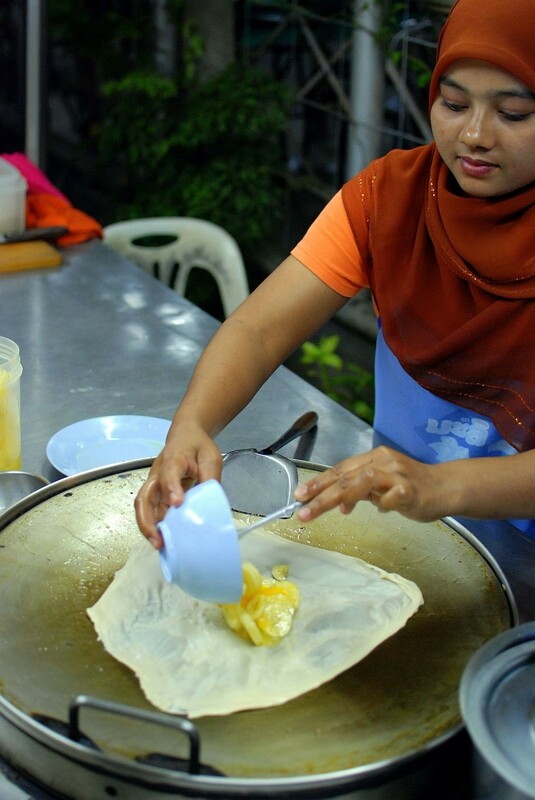 For dessert, stop at one of the many Roti stalls for a fabulous pancake cooked fresh in front of you. It’s then covered in condensed milk, Nutella, coconut and banana or a combination for those with a really sweet tooth!